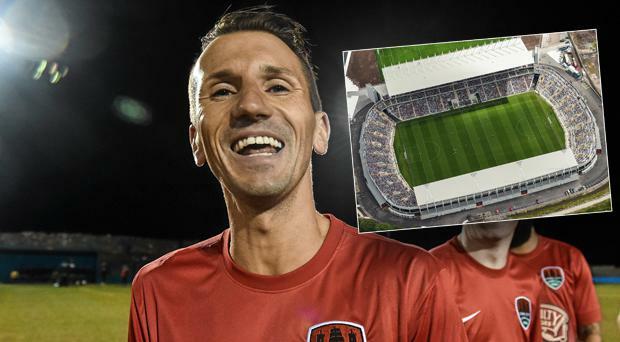 Gary Neville has hit out at the controversy surrounding the hosting of Liam Miller’s tribute match in Pairc Ui Chaoimh. The former Manchester United right back, who is part of a star-studded team that will take on an Ireland selection in Cork on September 25 admitted that he was baffled by how any negativity could possibly be drawn from the situation. After plenty of controversy in the public domain, the GAA eventually agreed to host the game in Pairc Ui Chaoimh, yet Neville insisted that even entertaining such a debate was “absolute nonsense”. Neville, who was in Dublin this afternoon to launch Cadbury’s partnership with the Premier League, said: “Until somebody asked me about it about two hours ago, I had no idea about the fiasco. “I don’t know the politics, I’m in a different country, in a different city. What I would say is, from afar, for people to even be debating about where the game is being played is an absolute nonsense. “The reality of it is, how people can even think about creating a negative story around where the game is: who cares where the game is played? “If the game is played in this room, if the game is played on the beach, or the game is played on a boat at sea, or at a football stadium, a rugby stadium, a cricket stadium, or on the pavement or the street or a bar, who cares? “The essence of the game is the most important thing. Neville also played a poignant tribute to Miller, his former team-mate who tragically passed away from cancer earlier this year. Neville admitted that it was an honour to be involved in the tribute match, which promises to be a hugely emotional occasion. “It’s absolutely terrible what has happened to Liam. I can’t imagine the pain and devastation that his family are feeling,” he added. “He was a good man, a good player and for us it’s important that we absolutely support this game and come over and do the very best that we can. “To be asked by Roy was an honour, because we obviously hold him in the highest regard. “Obviously, we’ve the greatest respect for him. So, when he asked, we said yes straight away, we were desperate to come over. “I’m not sure if we’re very good at playing anymore, that’s the problem that we’ve got, so don’t expect too much, but we’ll do our best and make sure we give our all and make it as good and attractive a fixture and a day out as possible and do Liam justice. “These associations of these national sports, they’re a disaster all over the world, it’s not just in Ireland by the way. It’s a nonsense, the whole thing’s a nonsense.